In this episode we discuss a proven way of overcoming the self-doubt, negativity, and insecurity that hold you back and we show you how to ultimately become your best self using a unique and unlikely strategy. We look at legends from pro athletes to MLK and uncover how they used the same exact strategy to get into the zone when it counts. We discuss all this and much more with our guest Todd Herman. Todd Herman is a high-performance coach and author of, 'The Alter Ego Effect: The Power of Secret Identities to Transform Your Life'. He is the creator of the 90 Day Year a performance system which is designed to create results for business owners, fast. He has worked with Olympic athletes, Entrepreneurs, and Leaders including members of the Spanish Royal Family. He's been featured on the Today Show, The Good Life Project, Inc Magazine and more. Based on what evidence do you need to have balance in your life? What is the alternative to finding balance in your life? What should you seek instead? Integration is far more important than balance - how do we actually integrate things into our lives? How do you move beyond the idea of work-life balance and move into integration? An alter-ego can be an internal trusted friend. Bring an ally inside your mind. How do you get into the zone? How do you get into flow states? How do you deal with resistance? Personal trauma? Self Doubt? Imposter Syndrome? The idea that you are one single self is completely flawed. Life is about context. You are different people in different contexts. You don’t build an alter-ego for your entire life. You build specific alter egos for specific contexts and opportunities. To meet force with force does not help when dealing with difficult people. All it does is prolong the tantrum and create problems. Be like Mr. Rogers. Don’t fight against yourself, leverage the way you naturally behave and turn that to your advantage. “Willpower is a terrible tool” to create change. Resistance comes from the unconscious and is extraordinarily powerful. Willpower comes from the frontal lobe. It’s like a mouse fighting an elephant. It’s not pretending who you want to be, its “activating” who you want to be. 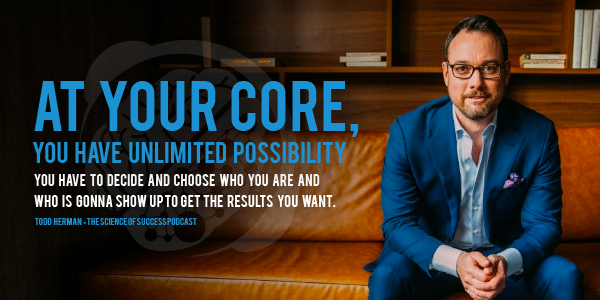 What happens when you get stuck in a “trapped approach"
At your core, you have unlimited possibility - you have to decide and choose WHO you are and WHO is gonna show up to get the results you want. Every single person - even you - has already done this - you’ve already use this idea. You just have to tap back into it. Playing with ideas is not a bad thing. What’s the critical difference between being childish and child-like? And why does that matter? This is about remembering something that’s already inside of you. Homework: Define what “field of play” it makes the most sense for you to use an Alter Ego in. Start with - what area of life are you most frustrated with? Homework: What are the traits you most want to bring into that field of play? Is there anyone or anything that already embodies that? A fictional character? A real person? A historical figure? Is there someone that you’re really drawn to? Your mind is constantly telling stories - if you tap into an existing story that’s already been written - you harness the power of it. Ask yourself - how can you ACTIVATE that? [Article] One Self or Many Selves? by Gregg Henriques Ph.D.
[00:00:11] MB: Welcome to the Science of Success, the number one evidence-based growth podcast on the internet with more than 3 million downloads and listeners in over a hundred countries. In this episode, we discuss a proven way of overcoming this self-doubt, negativity and insecurity that hold you back, and we show you how to ultimately become your best self using a unique and unlikely strategy. We look at legends from pro athletes to MLK and uncover how they use the same exact strategy to get into the zone when it counts. We discuss all of these and much more with our guest, Todd Herman. Do you need more time; time for work, time for thinking and reading, time for the people in your life, time to accomplish your goals? This was the number one problem our listeners outlined and we created a new video guide that you can get completely for free when you sign up and join our email list. It's called How You Can Create Time for the Things That Really Matter in Life. You can get it completely for free when you sign up and join the email list at successpodcast.com. You're also going to get exclusive content that's only available to our email subscribers. We recently pre-released an episode in an interview to our email subscribers a week before it went live to our broader audience. That had tremendous implications, because there is a limited offer in there with only 50 available spots that got eaten up by the people who were on the e-mail list first. With that same interview, we also offered an exclusive opportunity for people on our e-mail list to engage one-on-one for over an hour with one of our guests in a live exclusive interview, just for e-mail subscribers. There's some amazing stuff that's available only to email subscribers that's only going on if you subscribe and sign up to the email list. You can do that by going to successpodcast.com and signing up right on the homepage. Or, if you're driving around right now, if you're out and about and you're on the go, you don't have time, just text the word “smarter” to the number 44222. That's S-M-A-R-T-E-R to the number 44222. In our previous episode, we discussed how our guest helped secret agents become more creative. We look at specific strategies to navigate personal change while empowering and using your imagination. How do you become more imaginative? What are the keys to sparking imagination and creativity and how do you use creativity to get through challenges and setbacks? We discussed all of these and much more with our previous guest, Beth Comstock. If you want to unlock your creativity and imagination, listen to that episode. Now, for our interview with Todd. [00:03:00] MB: Today, we have another awesome guest on the show, Todd Herman. Todd is a high-performance coach and author of The Alter Ego Effect: The Power of Secret Identities to Transform Your Life. He's the creator of the 90 Day Year, a performance system which is designed to create results for business owners fast. He’s worked with Olympic athletes, entrepreneurs and leaders, including members of the Spanish Royal Family. He’s been featured on the Today’s Show, the Good Life Project, Inc. Magazine and much more. Todd, welcome to The Science of Success. [00:03:31] TH: Matt, I'm excited to be here, because it's refreshing to talk to someone who values evidence and the scientific approach to success as much as I do. [00:03:41] MB: Well, that's awesome and that's one of the reason that we wanted to have you on the show, Todd. We were kind of getting into this in preshow, and so I wanted to just jump in and start recording. Let's expound on that topic. One of the things that I was telling you that is huge for me is there's no perfect way to resolve anything or really find the truth, right? In this life, nothing is certain, but one of the mental models that I like to use is this idea that science and data is one of the best mental models for predicting outcomes in the world and it gets proven wrong, it’s not perfect, but I really think it’s, at least in my experience and my research, one of the most useful ways to think about personal development. [00:04:25] TH: Yeah. Well, I mean, the way that I think of it too is does this exist in nature? I think nature is the ultimate litmus test of whether or not if someone is sharing an idea, whether or not it's got some sort of truth behind it, because if something doesn't exist in nature, then we need to really look at it then, because nature is – That’s where we come from. So there's up and there's down. There’s inside, there’s outside, there's duality. So it’s like the idea of balance. Balance does not exist in nature. It's trying to bring something back to an equilibrium, but this idea, say, in a personal world, where you have to have balance. Well, why? Based on what evidence do we need to have balance in our life? Because it does not exist in nature. So why are we going to conform and try and constrain ourselves into a model that just does not exist, and many people create rules in their lives that are literally designed to force you to struggle, and balance is one that's going to force you to struggle and possibly beat yourself up. So I agree with you a hundred percent. [00:05:29] MB: That's really interesting. So obviously we’re going to get into your book and talk about some of those ideas, but before we do, this idea of balance is kind of interesting, and I’d like – It's a little bit kind of controversial. What would you say the alternative to balances and how would you think about for our listeners what should they seek instead and how do they do that? [00:05:49] TH: Well, yeah. A, it’s just understanding that, especially for the people who are trying to strive, achieve, really like explore a lot of what their capabilities are. There are times when you are going to be throwing yourself out of balance in order to achieve that, because you need to be pushing past comfort zones, or just in order for anyone to achieve something, there needs to be a level of focus on that change that needs to happen, which means you need to be giving up focus on other areas of your life possibly. For example, right now I'm getting ready to launch this book that I have, that took me years to right. Now, of course, you're in that messaging where you're trying to get it out there, and it's so important to me that I have to let it go. I’ve got all of the other fields of play that I stand on in my life, right? With my family, I’ve got three little kids. My wife, friends, hobbies, and I go, “Okay. So I can't launch this thing out there and get it to where I want it, to get it towards – Or get it to by continuously still meeting up with my friends every single – Like there's just things I need to cut out. So now all of a sudden people go, “Oh! Well, that person isn't leading a balanced life.” No. No. No. It's by choice. I've chosen something else to be focused on in the next 90 days. So it's really helpful for people to understand so that you don't beat yourself up saying, “Oh, man! I've been working so hard on da-da-da and I'm not seeing my friends.” Yeah, but if you choose to do it, now you’re not going to beat yourself up over it. So the idea that I have – Now, I grew up on a huge farm and ranch in Western Canada. I live here in New York City now, which is the center of ambition on the planet. On the farm, it was such a great model for me to grow up inside of, A, because like I’d said before about nature. You learn about nature and what truly does work and doesn't work, but also there was no idea of work life balance. We lived where we worked. So I never thought that dad wasn't coming home from the office. He was out in the field. So integration is far more important to me. Now, how does that practically play out? Because I know that one of things that you do really well on the show is you actually get people practical advice as well and not leave people like up in the clouds. I thought to myself, “Wait a second. I don't want her establishing some sort of attitude or belief or whatever the case is that work is bad.” So I start every single day the exact same way. I sit down, and I’ve done this since I was just before my 22nd birthday. I write a handwritten note and I seal the letter with a wax seal and I send it off. So I've written well over 4,600 letters now to people. So the very next day I brought Molly and Sophie in with me and I have the box where all the tools are, like the letter, and the wax seal, and the wax itself, and the stamp, and all that and I got them to unpack it for me, set it all out for me, get me ready for my day, open up my laptop for me and get me ready. Now I’m integrating them in, and Sophie's response as soon as they had my desk all set up for me, she was like, “Okay, Molly. Let's go. Let’s leave daddy to get to work.” Then I heard her walk out the door and she said to my wife, Valerie, “What can we work on now?” So that’s just like an example of I'm not worried about balance. I want to integrate things in. How can I make everything just swim together, not keep it so separate. [00:10:15] MB: Yeah, I totally agree with that, and I want to come back to Alter Egos in a second, but another kind of quick experience that I've had as well, I don't really see any distinction between work and life. They’re just one on blended thing for me, and I think it's important sometimes to have periods where you unplug from everything and really get that rest and relaxation, but at the same time, when I go on vacation, if I go to the beach for – I might go to the beach with my family for two weeks, but during that time, I might go surfing and then I'll come back in the afternoon and I'll work on a financial model or have a conference call or something like that, and I don't view that as working on vacation. I just view it as that's my life. So sometimes on a Wednesday afternoon I might play video games the middle of the day. It's all one fluid thing that is completely kind of interwoven. [00:11:05] TH: Yeah. It's the beautiful thing about the age that we’re living in now, and it can also be a handcuff for many people. I’d say generation X, like my generation, we've had to kind of stand on this border and balance this kind of we grew up at the latter end of that kind of industrial age and computer age and we started developing our themselves professionally at this huge shift that was happening where there was – you could start working from home. I think probably my generation really has a struggle with that almost schizophrenic nature of when you work at home – Like when I first started my business, actually I started it at my home in 1997, and when I told people that, that was back when people thought you're just basically unemployed if you're working from home. But this kind of great era that we live in now is we have this fantastic choice and I think some people struggle with the idea that they're not being productive or efficient if they're not always working, and that work happens between nine and five. But now the shift has happened where you work whenever you want to now. There is no defined time where you need to be working, and if you want to go play video games at 1:00 in the afternoon, do that, if that's the way that it kind of feeds you. So some fun stuff that we all have to navigate. [00:12:27] MB: Yeah, it's very interesting. It's a very distinct quandary. But I want to make sure we have some time to really dig into your book. So I want to transition and talk about alter ego. So the title alone really begs the question or makes me think, and I'm curious, what exactly are alter egos and why did you decide to write about that and why are they so important for personal development? [00:12:54] TH: Sure. So there're many reasons and there're many powers to it, but alter ego was first mentioned in 44 B.C. by Cicero, the great Roman philosopher and statesman. Considered to be one of the greatest of all time, and the term itself in its root form truly means the other I or trusted friend. When you think about just how we all need to navigate life and be successful, there's really no denying the fact that having a phenomenal Rolodex and having great relationships is extraordinarily powerful. In fact, of all the studies that talk about happiness and joy and fulfillment in life, every single one always has a component of relationships playing a huge or massive part of that. Okay. So that's at the external space. But this idea of an alter ego being a trusted friend internally, in your mental game. I've played between the 6 inches of the years now for 22 years working, like you'd said in the intro, with Olympians, and business leaders, and public figures, and many, many people struggle with that inner voice that will beat them up or stop them or create resistance. What an alter ego – Again, with that trusted friend, now you’re bringing in ally internal to help you navigate that with more grace and allow you to bring those innate qualities that you do have that might be not showing up in your performance to leverage the idea of an alter ego and bring them out on to a field of play so that you get the results that you want and you’re showing up like you know that you can, but in some way through your current kind of self, there’re some sort of resistance that’s happening. So I got into using alter egos myself at a young age when I was playing. I played football and kind of how they’re recruited, and I went on to play college football. I was also nationally ranked badminton player as well, which typically people don't think of those two going together, badminton and football. But when I would go on the football field, I would channel my – What I called my inner Geronimo. I’m a massive Native American fan and buff and I created this kind of tribe of warriors in my mind. One was Walter Payton, another was Ronnie Lott, both Hall of Fame football players in the NFL, and then this tribal like Native American warriors, and I brought them all together and I just called that entire composite Geronimo. So when I showed up on that field, Todd didn't play the game. Geronimo did, and Geronimo – I was 6 feet and like 156 pounds soaking wet. So I could easily get caught up in the fact that I was not a big guy, but Geronimo would never have those thoughts in his own head, and I channeled the strengths of those people to bring my performance to a level on that field. For myself, I'm always trying to find, whether it's someone like you Matt, or it's an athlete, or whether it’s an entertainer, the core of my work is to help someone get into the zone and flow state where there is no judgment. You’re just so caught up in the process. When you're in that experience, you're literally allowing every single ounce of your capability to get out of you in that moment without any sort of restriction of negative self talk or whatever. It's a massive allowing that's happening. Alter ego was one of my top tools that I would go to when working with people after I started my business to allow them to get out on the field. To kind of carry this forward, when I started my business at the age of 21, I look like I was 12, Matt, you're actually very similar. You’ve got a young face too, right? [00:16:38] MB: I definitely do. Oh, yeah. It dawned on me that all the people that I thought were confident and smart and articulate and all these things all have glasses when I was young. So I thought, “Well, why don’t I leverage that,” and I’d put on my helmet when I went on the football field to channel Geronimo, but then when I went – What could I used to kind of trigger and signal this confident and articulate and decisive self in business, and the glasses was going to be my tool. I’m going to get to the power scientifically behind this in a second, because it leverages a psychological phenomenon that we all carry with us. So that's what I did. I went to LensCrafters in West Edmonton Mall in Edmonton, Alberta where I was living at the time, and I went to the optometrist and I got a pair of nonprescription glasses. This is like in the late 90s when wearing glasses wasn't a cool fashion thing at all. Everyone was getting LASIK eye surgery trying to get away from glasses and here I am walking and the optometrist is giving this weird look at me, like, “You don't need glasses. Why are you getting glasses?” I’m like, “Can you please just shut up and give me the glasses please?” So that's what I did, and I would put those on and I would step into my Superman version of myself in business, just like Superman would put on his glasses become Clark Kent. I did the reverse. I was putting on the glass to be the Superman version of myself for business to carry forth the traits that I most wanted to show up and stop feeling so insecure. Now, what this actually leverages, because we want to talk about evidence, is this phenomenon called enclothed cognition. So human beings carry with us this sort of phenomenon that we have clothing and things that we wear, or in society there is clothing and there are artifacts and totems that signal to us an idea of what that thing is all about, so a lab coat, or a doctor's coat, or police officer's uniform. Now, the fascinating thing about this is when you put that thing on yourself, you will actually enclothe yourself in that same meaning and you will cognitively start to act through those traits yourself. We all have maybe a power tire, or we have like a shirt that we put on that makes us feel good. That's why that whole idea of look good, feel good; behave good, or act good works. It's actually proven out with science. So the Kellogg School of Management did this really great study where they brought in a bunch of students into a room individually and there was – I don’t know if you’ve ever seen this before, Matt, but there’s like this little puzzle that you can do where a bunch of boxes, and in each box is the word of a color. But then it's colored in a different color. Have you ever seen those before? [00:20:14] MB: Yeah, I've done one of those tests before. [00:20:16] TH: Yeah. So it’s like the word green, but it's colored in yellow, and then the word blue, but it's colored in red, and so on, and there’s probably like 25 of these on a grid. They brought these students into a room and they wanted them – They were going to test them on their accuracy, their attention to detail, the amount of mistakes that they're going to make and the amount of time it was going to take them to say all of the words, because our brain processes the color first before it processes the word. So it's a real kind of mind trick. So anyways, they brought them in and individually they would go through this and they would track them. So that group gets done and they record all the data. Then they bring in another group and they hand them a white coat and they tell them that it's a painters coat and they get them to do the exact same experiment. So then these people leave and they bring in another group, hand them exact same white coat, but this time they tell them it's a lab coat or a doctor's coat and then they do it. Okay. So what you think the difference was in the results between the painters coat and plainclothes people? [00:21:15] MB: I'm not sure. I mean, obviously, I think the painters coat would've maybe made people feel more creative. I'm not really sure. [00:21:21] TH: That's right. You’re dead on. That means they’re more creative. However, does being more creative help you for that specific task? [00:21:28] MB: Yeah, I probably I heard it too. [00:21:30] TH: Yeah, it actually didn't, and what happened was they had the exact same results as the plainclothes. So there’s no effect that happened. However, the people who wore the lab coat or the doctor's coat made less than half the mistakes as everyone else, and they completed the task in less than half the time. So what happened? Well, they enclothed themselves cognitively into the mindset or the actions, behaviors, of someone who is detail-oriented, right? They’re methodical. They’re careful. They’re studious, all things that we associate with someone who might be in a lab or in a doctor's coat. Powerful – This is like a powerful little phenomenon. Well, me, as someone – Like I'm the practitioner, Matt. I'm not someone who wrote the book because I found this idea. I've been working with people one-on-one for 22 years now, and I do group stuff. I do events, but I still do a lot of one-on-one. Over the course of my career, I’ve worked with people over 16,000 hours one-on-one. When you work with people one-on-one, I'm paid to help people perform better, right? Like in the professional athletics world or Olympic world, you’re not going to be able to work with people on a consistent basis if you're not actually making a difference with people’s performance. So my biggest issue, and this is what I appreciate about your podcast, is that there are so many ideas that have been spread from the personal development, self-help leadership world, for so long that are not rooted in real evidence. They’re nice ideas, lovely ideas. It sounds like I would really want that thing to truly work, but they don't often times. So the alter ego taps into the one thing that we truly are gifted with as human beings that makes us unique on the planet, and it is our creative imagination. Einstein said it, that our imagination is more powerful than knowledge, and our creative imagination is truly our gift to handle the world and handle it with more grace, but we can also create a world inside of our heads that can hurt us, right? We can create heaven from hell or a hell from heaven. We have this fantastic ability to create story and narrative in our minds. That's what we do, and an alter ego is like the backdoor into our creative imagination to fight against the other part that we have inside of us, which is Carl Jung would call it the shadow self. In the book I call it – Just to give it more – To give it kind of the thematic, the theme that I have rolling through the book, I call it the enemy, and the enemy can pull us into the shadows. What is it do? It uses things like resistance, which can come in the form of, “Hey, personal trauma.” There's a lot of people who’ve had some tough things happen to them, me included. I've had – Or there’s people who have imposter syndrome, that idea that they always are discounting their achievements and what they've achieved in life or their wins that they’ve had and they’re concerned about people finding them out or not having enough skill yet, and it stops you from taking action. There's any one of a number of different forces that stop us; doubt, worry, the judgment of others, right? An alter ego can more gracefully move past that and really pull those qualities and traits that are really actually in the skills that you have inside of you out-past it and on to the field for people. So for me, I love diving into in the book like just the history of them, who has used them in the past. A lot of people would be surprised at who has used them to leverage this idea and pull the best of themselves out there the – Like I was saying, with the enclothed cognition, the science of how to use this to activate things. I was using the glasses to activate specific traits and step in that kind of inner business Superman. I’ll tell you a quick little story if you don't mind. I was doing a speech in San Antonio, Texas. It was a leadership event back in 2004. I mentioned the idea of alter ego and the glasses and how I have perfect 20/15 vision, but I use glasses and use glasses when I started out to be very intentional about who and what was going to show up on that field for me. Afterwards, this lady came up to me and said, “Listen, Todd, I loved your talk. Specifically, I liked your story around how you use glasses,” and it's funny, because Martin never needed glasses either. He had perfect vision and he had nonprescription glasses too to help him do the hard things that he was out there doing. What's important to note is the Martin that she is referring to, when I looked down, if you saw her nametag, her name is a Coretta Scott King. It’s Martin Luther King's wife, and she was telling me and went on to tell me that he would step into what he called his distinguished self, because he felt like he was leading such an important movement and on such an important mission that he didn't want whatever insecurities that he had gathered up over his life to get in the way of that mission. So he put on those glasses as a way of stepping into his distinguished self and do the hard things to continue to move that mission and movement forward. So I kind of share that story in the book, and many other people that have used it along with just the science of what you're tapping into inside. [00:26:28] MB: It's so fascinating, and there's a number of different things that I want to unpack out of this strategy, this whole notion that you have these kind of physical triggers, or tools, or totems as you call them, is really interesting and I've never come across that or thought about that as a strategy, but it makes so much sense, and it's something that I think is very eminently applicable for a lot of people as well. [00:26:55] TH: Yeah. Well, you mean how often have you heard people talk about the power of intention, right? [00:27:01] MB: Yeah, all the time. Yeah. [00:27:03] TH: All the time, right? And they say it and I always thought, “Okay, that’s a lovely idea,” but then once I got into this work more, and even before, Matt, we were talking about the power of like just integration and you were saying how there is no difference for me in like work and life. It's all just one thing. There have been a lot of shifts and changes in the psychology world in the last few years. If you could basically say that it has been disrupted massively, because a few of the fundamental pillars that have made up the philosophy of psychology have been basically brought to the ground, because those old studies have been proven to be non-replicatable. But one of the things that has been shifted, for the longest time in the psychology world had always kind of spread the idea or message that, fundamentally, the healthiest human beings are the ones who see themselves as a single self. That is broken now. In fact, there is more evidence showing now that the people who think that there's one single self that you carry around all of the different fields that you go when you live in typically have a very, very high-level of – Or a propensity towards having mental health issues, because life is about context. Now, an extremely fast growing area of study in psychology is this theory of multiple self theory, which is that understanding that we live contextually, right? Like, Matt, who you are with me right now is, of course, going to be slightly different and different than who you are when you're at home, or when you're playing sport, or when you're with your family, or significant other, or whatever the case is. There traits and parts of our personality that get magnified so that we can perform to our best ability, whatever that might be. Again, it's not performing in the way of acting. It's performing in the context, for me, of getting a result that you want, okay? So context matters. So for building alter egos for people, it was always contextual. You don’t build an alter ego for your entire life. The Todd that shows up and has glasses on in business, now, I don't bring that. I’ve got a challenger personality type. When you're working with high-achieving people, you've got to challenge them, because they’re around nothing but yes people a lot of the times, and they're just operating at such a high-level that I need to be challenging them on things. But do my little kids want that aspect of my personality at home when they just want a fun, playful, get on the ground and muck around from dad? No. But it would be very easy for me to take that home with me, because so much of my day is sitting, doing this work. So when I – And I'm still at a young dad. My oldest is only six, but I was carrying that home too much and then I thought to myself, “Wait a second. I need to create context here. Who would I most like to be inspired by to show up in the home with my kids?” and it was easy to go to Mr. Rogers. I grew up with Mr. Rogers, the prolific children's entertainer, and I thought to myself, “At my core, I know that there's a gentle self that's in there, because absolutely there is,” an Mr. Rogers is such great inspirations. So that's who I would like to most show up as or bring as a spirit into that moment. Where this came to a head for me was my middle daughter, Sophie, has let's say a fantastic emotional bandwidth. She can have fantastic eyes and very quickly go to a fantastic tantrum. When a young kid is having a tantrum, any other parent that’s listening knows that to meet force with force does not work. You can yell and scream at them, you can challenge them and dominate them by your size, but that's not going to help the situation and that would probably be an easy default for me. But the moment I got down on one knee and – Because it was the day before that's exactly how I acted. I challenged force with force and all it did was prolong the tantrum for 15 minutes. But the next day when I really channeled that idea of Mr. Rogers, I got down on one knee just like he would and I reached out to Sophie, I grabbed her, I pulled her in and I gave her a big hug just like he would, and she melted. Her tantrum went from lasting what would've been 12 minutes till like 13 seconds, and we all have this where we see her kids then run off and they’re playing and it’s like nothing just happened and you’re like, “What? You guys are insane!” But I'm not there to solve the psychology of children. I'd much rather meet it in a way that's more meaningful. So that's the power of that in action contextually. Same thing with all my athletes, we’re building the alter ego, or that character or persona for that field of place. So now that's taking that power of intention and you going, “Who and what do I most want to be showing up as on that field to help me be as successful as I possibly can?” Then it's to override whatever self-doubt you have that you can do it. Why not tap into and leverage our creative imagination and not forget about it and use it to your advantage and maybe step into your inner Yoda, your inner Luke Skywalker, or Wonder Woman, or whoever that might be for you? [00:32:15] MB: This is a little bit of a tangent, but I love this notion of not meeting force with force and channeling Mr. Rogers. What a thoughtful approach to dealing with any difficult emotional situation or difficult individual. [00:32:30] TH: I mean, can you imagine if the leaders of our world that had their fingers over top of war machines handled things with a little bit more. Mr. Rogers? We would probably be living – And this is coming from a fairly hard-charging ambitious person, but I can tell you that we’d probably be living in a far different world, definitely. [00:32:50] MB: This episode of The Science of Success is brought to you by our amazing sponsor; Athletic Greens. I've used Athletic Greens for years to make sure that I'm on top of my game. I'm sure you've heard about it from other experts, like Tim Ferriss or even previous Science of Success guest, Michael Gervais. Athletic Greens is the best of the best all-in-one whole food supplement on the market. Just one scoop of Athletic Greens is the equivalent of 12 servings of fruits and vegetables. It was developed over 10 years by a team of doctors and nutritionists using 75 whole food sourced ingredients. Athletic Greens helps you fuel up with energy, boost your immunity, supports digestion and gut health, helps you manage stress and promote healthy aging and much more. Athletic greens was kind enough to put together a special deal just for Science of Success listeners. They are giving away 23 travel packs, which is valued at $79 when you make your first purchase. Start 2019 off right and created epic shifting your health by ordering some Athletic Greens today. You can do that by going to athleticgreens.com/success. That's athleticgreens.com/success to claim your special offer today. [00:34:10] MB: So I want to circle back and talk about some of the struggles that people deal with and why this idea of an alter ego can be such a powerful tool, because when I think about the listeners, I'm sure there's people listening to this who face, as you call it, resistance. Whether it is a trauma they're trying to overcome, whether it's self-doubt, imposters syndrome, etc. How does this specifically help them overcome those challenges and those struggles? [00:34:39] TH: Well, you know Matt, when you're looking at me or my life or you’re looking at someone else where you're not living inside of my head. We all do this, it’s the grass is greener effect, right? Where we go, “Oh, I can see how that works with that person, but I've got this going on, or I can see why that person built business up to being successful, because –” And we gloss over someone's life very easily. Human beings do that by very nature. That's just what we do. So me, as someone who’s a practitioner, I’m simply trying to leverage existing things that we do naturally, not fight against things like many people in the self-help world loves to push out the idea. Like the number one tool that most self-help personal book will typically give people leadership book is the number one tool is willpower. Of course, willpower is powerful. Yes, we do have the power of the will, the free will, but it is a terrible tool to use to overcome ourselves and change. Why? Because resistance comes from the unconscious and is extraordinarily powerful. Willpower comes from the frontal lobe, and on the grand scale of size, think of it like the mouse coming at the elephant. Just good luck with that. That's why most people wear out after – you can use willpower to steer yourself for a few days, a week, or a couple of weeks, but over time, typically, the unconscious and that resistance will win, typically. I didn’t say all the time, typically it will, which is why most people will struggle. Well, if this grass is green on the other side effect naturally happens, well, that's one of the things that we’re utilizing when we’re using an alter ego or a persona and tapping into someone and something else’s superpowers. Because we look at, say, James Bond, or we look at Daniel Craig, or we look at Michelle Obama or whoever it is that we might admire and we go, “Oh, I want to use their traits, because they just show up in an X, Y, Z way.” You're only seeing one part of that person's existence, and we’re not going deep because we don't have that person's narrative and storytelling going on. So why would I fight that? Instead, I’m going to use that and help you, a client, whatever, tap into it and step through that individual, that thing that might be being used, to help bring your traits out on to the field. So it's such a natural thing, and what you're just simply tapping into is that kind of – That gloss effect that we have. We strip away all of the negative that that person would have had to deal with in order to get to where they are and we’re just simply seeing the positive traits that that person has. He was like, “Yeah. When people know my history, they know that I was actually a really angry kid, just filled with lots of emotion, and it sounds like that would work out well for you on the football field, but really what I did was I took a lot of bad penalties. I was not the most coachable kid because of it, and it was getting into some trouble. One night I was watching a movie and I saw this character come on the screen that was cold, calculating, methodical, unemotional and I thought to myself, “Wait a second. What if I brought that character on to the football field instead of this like angry and rageful and emotional kid? If I was unemotional and calculating and cold, that would seem to like help me out,” and the character that he saw on the screen was Jason from Friday the 13th. Now, again, in context, on that field of play called football, that mission serves that person. In business – And this is what – He did it so innately smart. That was the context. He didn't take Jason into business or into the classroom or anything like that that. That was where Jason lived, was out there on the football field. Same thing for me, I leave that Superman version of myself in business in my office, or on those moments of impact that matter to business. I don't take that home to my kids. That idea of myself is inspired by someone and something else. Then what happens is Cary Grant, this great Hollywood golden age actor in the 1940s and 50s, well-known for being like debonair, and charismatic, and well put together. He had this great quote near the end of his life where he said, “I pretended to be somebody I wanted to be, and I finally became that person, or he became me, or we met at some point,” and that encapsulates just the perfect idea of this. The only thing that I would change in his quote is instead of I pretended to be, it’s I activated somebody I wanted to be, and I finally became that person. Id if you think of it like who you are today as a Venn diagram, there's a circle on the left-hand side and then maybe who and how you want to show up in another circle, and maybe they don't overlap perfectly right now with your performance. But the bridge between the two can be the idea of an alter ego or a secret identity to help bring and merge those together and then at some point in time you've actually become that new self naturally, if that makes sense. [00:41:32] MB: Yeah, that definitely make sense. I think it's important for somebody who's listening who might think to themselves, “Okay. So this is basically just fake it till you make it.” What would you say to one of those listeners? [00:41:42] TH: Not even close. Yeah. I mean, again, this gets back to the idea that people in the personal world have done a terrible job messaging a lot of things. Fake it till you make it. This has nothing to even remotely come close to that, because faking something till you make it, just that idea is about external. That's about trying to – Yeah, if anytime you’re trying to do something to deceive others or trick others, that's activating, or that's operating from what I call an outside-in approach, and you will always create – I talk about in chapter 3, a trapped self. Because any time you are being that influenced by what's happening on the outside world in order for you to operate on the inside, that's where you have this issue of being inauthentic. This is about really having people understand that at your core self, there is this unlimited possibility that sits inside of a human spirit and a human person, and that you are being very intentional. You're taking the power back. You’re deciding and choosing who and what you want to show up on that field so that you can get the results that you're really looking for, and that your field of play is far more representative of how you think you truly can perform. Nothing beats up a person more at the end of the day than when you put your head on a pillow and you beat yourself up with, “Man! I wish I would've said this instead of that,” or “I wish I would have spoken up,” or “Why didn’t I raise my hand?” or “Why didn't I ask for the sale when that person was – It was perfect fit for them.” There some sort of resistance there for people, and that's being inauthentic now. True inauthenticity is when you could be doing something and you're not doing it, and I know that to be true, because I've done this for two decades and I know how people beat themselves up. When you're not out there doing the things that you know you can do or want to do and something else is getting in the way, that really beats up people’s self-efficacy, their self-esteem, their self-confidence. A trusted friend, and alter ego, the other eye to help you navigate that with more grace to bring out those abilities helps to make that happen. So fake it till you make it is a terrible idea and it has nothing to do with leveraging an alter ego to help make that happen. [00:43:58] MB: That's a great point, and it gets back to this notion of self-sabotage, right? This idea that if you’re getting in your own way, if there're things you could or want to do that you're somehow not able to, then you’re sabotaging yourself. We start to internalize growing up, meaning, “Oh! Me playing with those ideas is childish.” No. No. No. There’s a difference between childish and childlike. If people would actually approach a lot more of their life childlike, they would be a lot more playful, they would probably take it a lot easier on themselves and they would start exploring more of themselves and what they can do, because that’s what we always did as a kid. So this is not about handing people a brand-new idea. I say it in the book, this is about me causing people to remember something that's already inside of you, and in some cases almost giving people the permission to start doing it again, because you're not strange, you're not weird, you're simply joining a tribe of people that have been doing this for a very long time and helping them to achieve things that other people get amazed by. [00:45:58] MB: So for listeners who want to concretely start implementing this in their lives, what would be one piece of homework that you would give them as an action step to begin that journey? [00:46:09] TH: Yeah. I mean, I’ll give them a couple here. So one is just define which field of play that it makes the most sense for you to possibly play with this idea for, and the easiest place to go to is what area of your life right now are you most frustrated with? It's so easy for people to think of in the context of say, media business and going out there and crushing it or whatever it is, but maybe actually it's with relationships, or its with your home life, or it’s with health and fitness, or whichever, but just first start with one field of play. Don't build out nine alter egos. Start with one to start playing with this idea, okay? So that’s step number one. Step number two, what are the traits that you most want to be bringing out there? When you think of like what would really help you succeed in that area. Are the things that you admire in other people, you’re like, “Oh! I wish I had that.” That's a signal. That's a signal of your creative imagination trying to nudge you in a certain way. So what would be those traits that you'd most like to bring out into that field? Okay? Is there anyone or anything that already embodies that right now? When you think of a favorite character from a book, like a fictional character or a nonfiction character that happened in history or something like that, is there someone that you'd most like to – Or that you're really drawn to? So that we can create form and shape. I mean, a big part of how our minds work is we’re storytelling machines constantly, right? By tapping into an existing story that's already been written because of someone else's life or in nature – I mean, Kobe Bryant, that's exactly what he did with the black mamba. I tell the story of how he came up with the black mamba and where he was inspired to get that idea from a movie that he was watching. So that kind of second step is where the superpowers or those traits you most want to start showing up that’s going to help you succeed. Is there anyone or anything that already has them to give you a better idea? Then as another step, is there anything that you could use then to help activate that, those superhero qualities or those traits out there? Like I did with glasses, or I did with the helmet, or other people have used bracelets, or wristbands in sport, or it could be your favorite shirt, it could be a uniform that you always wear, which is an extremely popular device that specially people in the tech space have used, weather it’s Steve Jobs, or Zuckerberg. That’s you being very intentional now about who and what is now showing up, because it’s that final moment where we’re, “Hey, when these glasses go on –” What ended up happening, Matt, was the arms of your glasses, they slide across your temple as you’re putting them on. After a while of doing this – Because I was being so intentional about how I was about to show up. It was almost like a switch was being flicked on and off when I took off the glasses. I was moving into a different self. But when I put them on, that switch was being flicked and I was stepping into that very specific self-built to help go and win on that field. [00:49:13] MB: Great pieces of homework and great advice. Todd, for our listeners who want to find you, your work, the book, etc., online, what's the best place for them to do that? [00:49:23] TH: Well, they can go to alteregoeffect.com, and we have like the links to all the different places around the world that you could buy it. Again, more information, some videos on there for people to read. My home base on the internet is toddherman.me. You can maybe learn more about me if you needed to, or see the other stuff that we've got going on, and of course all my social kind of links are on there too. [00:49:43] MB: Well, Todd, thank you so much for coming on the show, for sharing all these wisdom. Some really interesting strategies, great stories, and really practical ways to implement this. [00:49:54] TH: Thanks, Matt. Super appreciate it. [00:49:55] MB: Thank you so much for listening to the Science of Success. We created this show to help you, our listeners, master evidence-based growth. I love hearing from listeners. If you want to reach out, share your story, or just say hi, shoot me an e-mail. My e-mail is matt@successpodcast.com. That’s M-A-T-T@successpodcast.com. I’d love to hear from you and I read and respond to every single listener e-mail. Next, you're going to get an exclusive chance to shape the show, including voting on guests, submitting your own personal questions that we’ll ask guests on air and much more. Lastly, you’re going to get a free guide we created based on listener demand, our most popular guide, which is called How To Organize and Remember Everything. You can get it completely for free along with another surprise bonus guide by signing up and joining the e-mail list today. Again, you can do that at successpodcast.com, sign up right at the homepage, or if you're on the go, just text the word “smarter”, S-M-A-R-T-E-R to the number 44222.